Security Council votes to authorize a 4,000-strong regional protection force within the United Nations Mission in South Sudan (UNMISS). The Council’s move to strengthen UNMISS comes just days before South Sudan marks the one year anniversary of an August 2015 peace accord meant to end the fighting that had erupted two years earlier, and in the wake of recent clashes between rival forces – the Sudan People's Liberation Army (SPLA) loyal to President Salva Kiir and the SPLA in Opposition backing First Vice-President Riek Machar – that broke out in and around the capital, Juba, on 7 July, close to the fifth anniversary of the country's independence. Just two days ago, UN Emergency Relief Coordinator Stephen O’Brien, who recently visited the country, reported that the humanitarian situation has witnessed significant deterioration, including in areas that were once relatively stable. Since December 2013, over two million people have fled their homes. Some 1.6 million are displaced within South Sudan and more than 900,000 people have fled to neighbouring countries. The resolution adopted by the Security Council today strongly condemned the fighting in Juba, including attacks against civilians, UN personnel, premises and property, and requested the Secretary-General to expedite investigation into the incidents. The text further expressed “deep concern at the tense and fragile security situation in the rest of the country,” including armed clashes and violence involving the SPLA and SPLA-In Opposition (SPLA-IO), and armed groups. Reminding all parties of the civilian character of protection of civilians sites in South Sudan, and recalling its resolution 2206 (2015), which states in part that those who engage in attacks against United Nations missions, international security presences, or other peacekeeping operations, or humanitarian personnel may be subject to sanctions, the Council went on to condemn all violence and human rights violations throughout the country, as well as obstruction of the work of UNMISS. The adoption of the resolution takes note of the decisions adopted by the Intergovernmental Authority on Development (IGAD) Plus Heads of State and Government in their 16 July 2016 Communique for deployment of a ‘regional protection force, and the 5 August 2016 Communique of the Second IGAD Plus Extra-Ordinary Summit on the Situation in South Sudan which notes the Transitional Government of National Unity’s consent to deployment of such a force in principle. By the resolution, the Council decided that while the protection force would be based in Juba, and would support of the outcomes of the Permanent Ceasefire and Transitional Security Arrangements Workshop, and in extreme cases, in other parts of South Sudan as necessary. It also stressed that the Regional Protection Force will carry out its mandate impartially and in strict compliance with international law, including, as applicable, international humanitarian law. 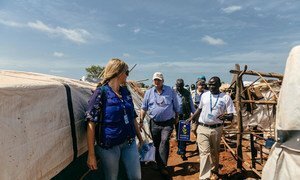 Recently returned from a three-day visit to South Sudan, United Nations Emergency Relief Coordinator Stephen O’Brien today painted a grave picture of the enormous humanitarian crisis facing the world’s newest country and the devastating impact of the ongoing violence on its people.